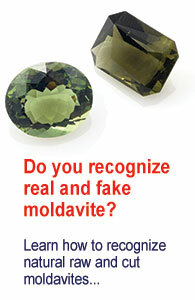 The general (scientific) theory of moldavites origin says that moldavites were formed by meteorite impact at Stuttgart (southwestern Germany) 14,800,000 years ago. Based on calculations and laboratory simulations, it is assumed that this meteorite was of a diameter from 500 to 1000 meters (1640 – 3200 ft.). Most probably the meteorite came from west-southwest in acute angle (30-50°). 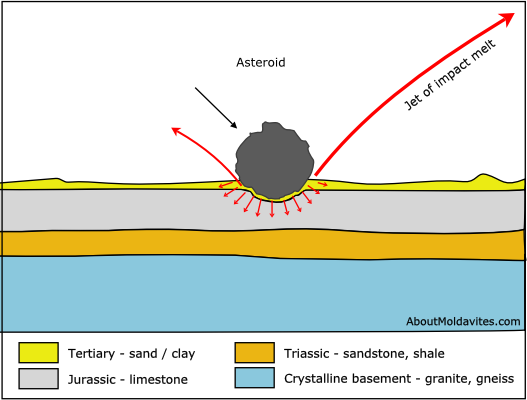 The impact of the meteorite created a big crater with a diameter of about 25km (15.5 mi.) called Ries Kessel. The meteorite split into smaller pieces before the impact. It is proved by the existence of a smaller crater with a diameter of about 4km (2.5mi.) called Steinheim. The distance from Ries Kessel is 30km (18.6mi.). 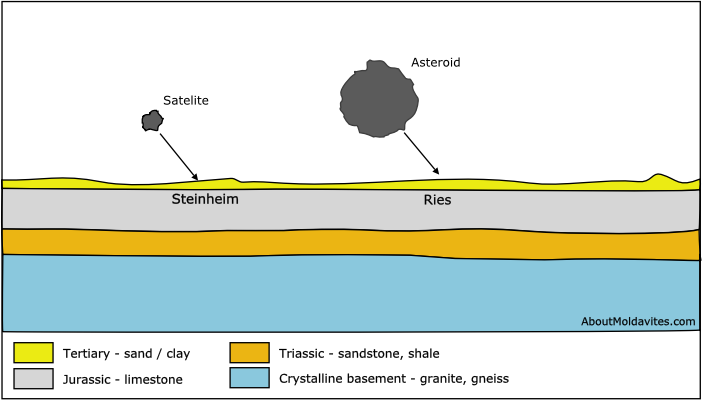 Scientists originally thought, that the Ries Kessel crater has a volcanic origin (leftover volcano crater). But in the crater can be found Coesite (unusual quartz variety) which was created from heavy smelting of rock under heavy pressure after a meteorite impact. The meteorite penetrated the Earth atmosphere with the speed of 22 km per second (13,7mi./s). During his flight through the atmosphere, the temperature increased to 5 000 – 10 000°C (9,000 – 18,000°F; on forward-facing area; pressure 500GPa). Consequent transfer of kinetic energy on the meteorite impact caused melting of underlying rocks and the meteorite and their catapulting to the upper atmosphere layers. In the atmosphere, the melt turned glassy and subsequently congelated. Drops of the melted mixture fell on the Czech Republic territory and were washed off to sediments. 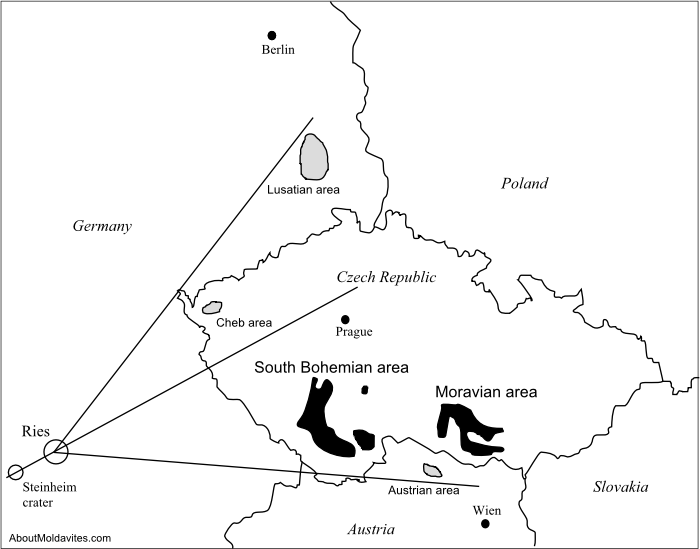 Current deposits of moldavites relate with this preserved Tertiary lacustral sediments, as is the case of areas in South Bohemia and Moravian parts of Bohemian-Moravian Highlands, around Trebic and around the river Jihlava. The impact angel determined the direction of the motion of the meteorite drops and the distance between meteorite impact and melted moldavites is about 450km (280mi.). Molted moldavites impact area is called fall field. Moldavites ware afterwards washed from some localities to secondary fields.